« * WINNER of the Energizer Power Kit Giveaway * Belinda M is Living the Life of Riley! My daughter has to be one of the wildest sleepers around! Ever since she started sleeping in her crib, we had to swaddle her or either have her in a sleep sack of some kind. Otherwise, she would either freeze to death or smother herself since she will sleep on every inch of her mattress at one time or another during the night. We have a video monitor on her at night and it's and the feats of acrobatics she undergoes are amazing! Now that she is becoming a "big girl", she loves mimicking everything her father and I do, including wearing robes at night. Unfortunately though, Riley couldn't keep a robe on after her bath because her play is as wild as her sleep. What's a mom to do? Introduce her to the Big Kid's SleepSack Wearable Blanket from HALO! The HALO Micro-Fleece Big Kid's SleepSack Wearable Blanket can be purchased on Amazon for $17.99 -$19.99. See my complete links in all available colors below. The Big Kid's SleepSack™ wearable blanket was designed for toddler's nighttime comfort and routine. It helps prevent kids from kicking off their blankets, so they stay warm and comfortable all night long! Foot openings provide mobility and comfort for Toddler. The Big Kid's SleepSack™ wearable blanket was designed in response to countless requests from parents for a larger size. It has been "kid tested" and mother approved for comfort, ease of use and fun! Made of premium micro-fleece each product comes in a reusable vinyl pouch with fun handle that can be used as a travel bag for toys or to take the wearable blanket with you. 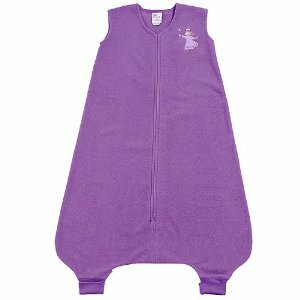 I was very happy to receive the HALO Big Kid's SleepSack because I could tell right away from the very soft purple micro-fleece to the embroidered princess on the front, that my daughter was going to love it. I was surprised to see how long it was! My daughter is 18 months old and in the 85% for height, so I ordered her the 2T/3T size. Sleep sacks are great if they're not too tight and HALO made sure that the Big Kid's SleepSack wouldn't be. I think Riley will actually be able to use this for several YEARS! I bet you can't say that about many other toddler products! I inspected the garment carefully and noticed that the zipper seemed pretty heavy-duty and the stitching around all of the seams was sturdy. I thought that the princess was embroidered nicely on the front and showed a lot of attention to detail. The only thing I was disappointed to find was that the SleepSack had two feet holes at the bottom. Now, don't get me wrong, I like the fact that you can slip the child's feet through the bottom when they're still awake and they can walk around in the sack before you put them to bed. I just don't like that once the child is put to bed, you have to dress their feet super warm since they will be sticking out of the SleepSack. My daughter is such a wild sleeper and so curious, that even if we were to slip her feet inside the sack once we put her to bed, she'd definitely put them back through the holes. In my opinion, this sack would be perfect if instead of just holes, there were snap-on micro-fleece booties that you could put the child's feet in. This way, they could walk in the booties if they wanted to, but the booties could also be removed if the child preferred to wear their own slippers while they were still awake. With the snap-on booties, the child's feet would stay cozy and warm along with the rest of their body once they were tucked in for the night. I slipped it on Riley and watched her walk around in it. In the large purple SleepSack, she kind of looked like Grimace! She was able to maneuver very easily and her feet did not slip back out of the holes on their own. Because it is made of micro-fleece, I didn't actually have her sleep in it yet, though. Here in Texas, the temperatures are already in the 90's, so she would have been much too hot wearing the micro-fleece. I know what one little girl will be wearing once the temperatures cool down again...her HALO Micro-Fleece Big Kid's SleepSack Wearable Blanket! The HALO Micro-Fleece Big Kid's SleepSack Wearable Blanket is a great investment which will help keep your child warm while they play and while they sleep. It is well-made and even has a fun character embroidered on the front. They come in several different colors and sizes and are very large and roomy for years of use. I don't especially like the open foot holes in the bottom of the blanket, because now you will have to make sure to dress your child in very thick socks at night. I don't feel that this is a deal breaker though, and still think it is a very good buy and something your child will surely enjoy. Disclosure: I received the Big Kid's SleepSack Wearable Blanket from HALO Innovations Inc. in order to facilitate my review. No other compensation was received. This product review is based on my own personal experiences with this item and is completely honest and objective. Pingback: Tweets that mention *** REVIEW *** HALO Big Kid’s SleepSack Wearable Blanket ~ Even the Wild Can Be Warm! chicBuds chicboom Keychain Speaker ~ Broadcast Tunes From Your KEYCHAIN!